You now probably think I’ve gone crazy in the head as I seem to have skipped January through April. The reality is a much sadder story. Pat, who would originally have received her blocks in May was diagnosed with ovarian cancer prior to the start of the F2F swap. She still wanted to participate because it gave her a goal and something to look forward to. Unfortunately, her condition has recently deteriorated rather quickly and it is very likely that she will not make it till May. When we found out it was quickly decided that the swap would be rearranged immediately. So last week everyone dropped whatever they were doing and quickly made up some blocks in tan and teal (the colour of the Ovarian cancer awareness ribbon) and shipped them off to Sue. I made 5 blocks since Pat can no longer make her blocks and 36 blocks are needed to complete the quilt top. In a frantic sewing session I completed 3 and ¾ block in a single evening and completed the 4th and 5th the next morning. Pictures were taken in just minutes and the blocks were shoved into an envelope before I rushed off to work. Let’s just say it’s a good thing my job doesn’t require me to clock in at a specific time. Sue will do the piecing and binding of the quilt top and the quilting will be done by her son who has a longarm business. Hopefully, Pat will receive her quilt in time to enjoy it for a little while. Eventually it will most likely be donated to the Ovarian Quilt Project where it will be auctioned to raise money to educate the public about the risk factors and symptoms of ovarian cancer. Since it takes some time for the blocks to reach Sue and the piecing and quilting will then take some more time, Kate already made a virtual quilt from all the pictures that we took of our blocks. Because I’m a scientist and therefore like facts and numbers I looked up some information about ovarian cancer. In the Netherlands around 1200 women are diagnosed with ovarian cancer annually. Most women are diagnosed when they are 55-80 years old, but it can also affect much younger women. Especially women that carry mutations in the BRCA1 and BRCA2 genes have an increased risk of ovarian cancer and are advised to have their ovaries removed when they are 35-45 years old as a preventive measure. You may already have heard of BRCA1 and BRCA2 before because mutations in these genes also increase the risk of breast cancer. One of the nasty things about ovarian cancer is that it can remain undetected for a very long time as the disease is usually asymptomatic in the early stages. When symptoms finally develop they are usually vague and could also have many other causes. Symptoms include a bloated feeling, feeling full or difficulty eating, nausea, pelvic or abdominal pain, frequent urination and severe constipation. I got my information from kanker.nl (a Dutch platform where patients can find information about cancer and interact with other patients to share experiences) and the website of the Dutch cancer institute (both websites are in Dutch). My sisters got me the boardgame Kingdom Builder for my birthday. We have played it a lot and I decided to get rid of one minor annoyance. 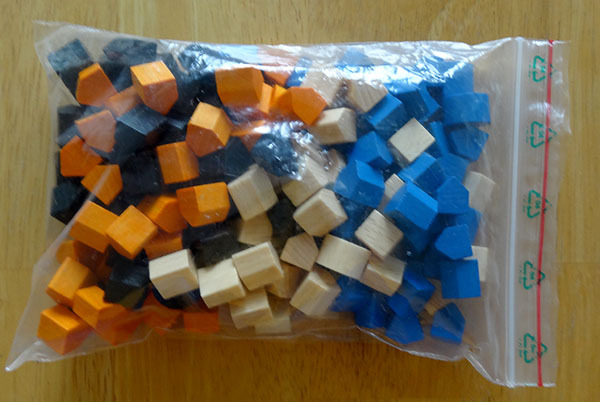 Each time we played we had to separate the differently coloured wooden settlement pieces because they were stored all together in a small ziplock bag. 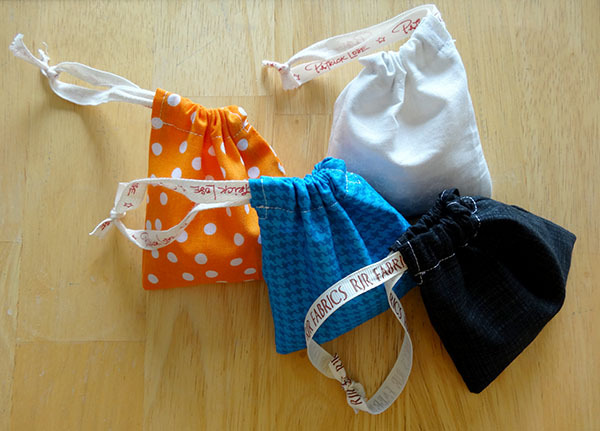 I thought it would be much easier if each colour was stored in a separate bag so I made some out of fabric. I took some pictures while I was constructing one of my pouches so you can see how they were made. Start with a rectangular piece of fabric and finish the long edges with an overlocker or a zig zag stitch. I made mine 5 x 10 inches (12.5 x 25 cm), but you can of course make them larger or smaller depending on how many pieces you want to fit in. 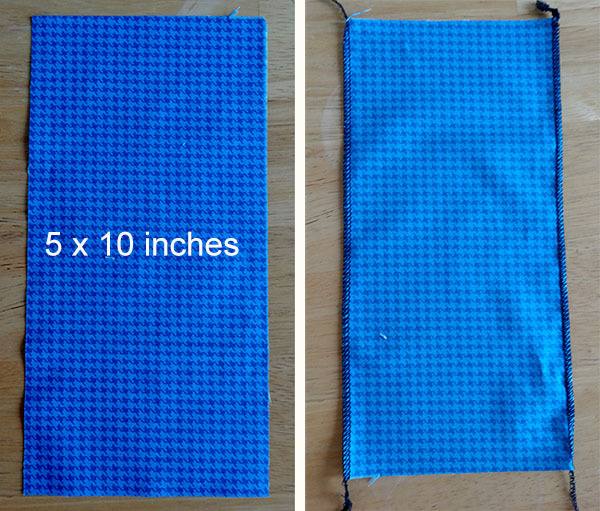 Fold the piece right sides together and stitch the edges, stop about 4 cm (1.5 inch) from the top and backstitch. Press the seam allowances open and topstitch it down around the gap at the top. 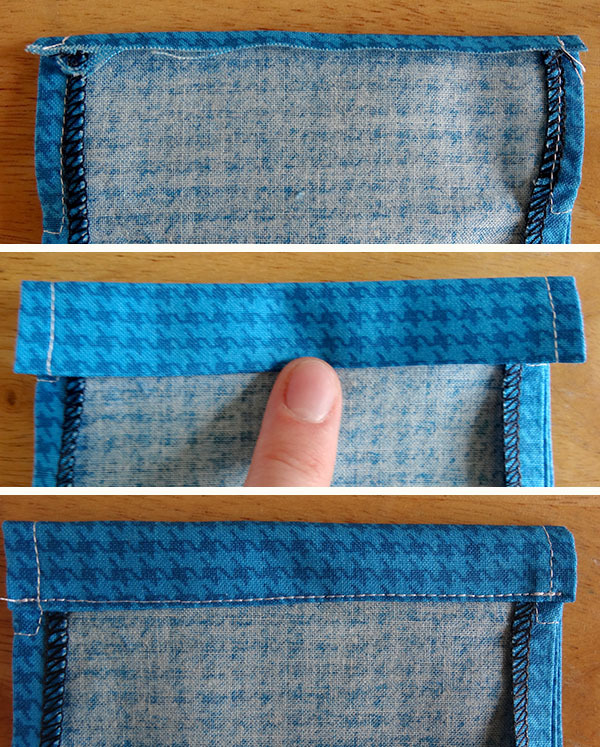 Fold a narrow strip of the top edge to the inside and then fold again to create a tunnel. The edge of the folded part should not extend beyond the opening at the side. Topstitch the tunnel close to the edge. Make sure the other side of the pouch is out of the way! Do this with both sides. Turn right side out and thread a piece of ribbon through the tunnel and tie the two ends together. I used ribbon that was tied around a fatquarter bundle. If you want to be able to close the pouch really secure you can thread a second piece of ribbon so you can pull on both edges to close it. Proceed to make a bag for each colour in your game. The blocks that I made for the October and November F2F participants arrived ages ago, the December blocks have been mailed and I’ve already received one package of beautiful green January blocks. Definitely time to catch up! October was Lynn’s month and her chosen colours were grey, turquoise and coral. For my first block I made two strip pieced triangles that were sewn together so that the direction of the strips in the second triangle was rotated 90 degrees compared to the first triangle. While some people might be tempted to make both pieces exactly a half square triangle, I didn’t. I think this is visually more interesting. For my third block I got a bit more improvisational and made some opposing triangles. It is quite a simple block but has an interesting visual impact that I’d like to experiment a bit more with. November was Avis’ month and her chosen colours were bright blues and purples. Avis likes symmetry (so I refrained from doing any wonky stuff), small prints and solids. For my first block I pieced long strips of fabric, cut that piece in four parts and then reassembled the pieces to resemble a windmill. I am from the Netherlands after all. For my second block I did more half log cabins, but this time made 4 and pieced them together with a narrow cross in between. I really like this effect too.I also really like the birds that are sort of peaking out. The third block has to be my favourite. I simply love, love, love how this turned out! I think this design would also look great on a pillow. Even though it was late at night I remembered to take some progress pictures that more clearly show how the block was created. To get this effect I first made four identical triangles, starting with an equilateral triangle and simply adding strips at two of the sides. When they were large enough I used a 12.5’’ square ruler to cut the top point to 90 degrees instead of 60 so I could piece the four triangles together to make a square. At this point make sure that you cut the four triangles in exactly the same way! Use the markings on the ruler to align them. Finally the block was trimmed to 12.5’’. If you want to try this block just make sure that you are generous with the size when you cut the four triangles, you can always trim the block when it turns out larger than 12.5’’ or whatever size you’re making, if it is smaller all you can do is add a border to make it fit and I think that will ruin part of the effect of this block. The only tricky part was that the center point where the 4 pieces meet turned out bulky from all the seams that meet at that point. As always the blocks that were made by the other participants can be viewed on the F2F page.